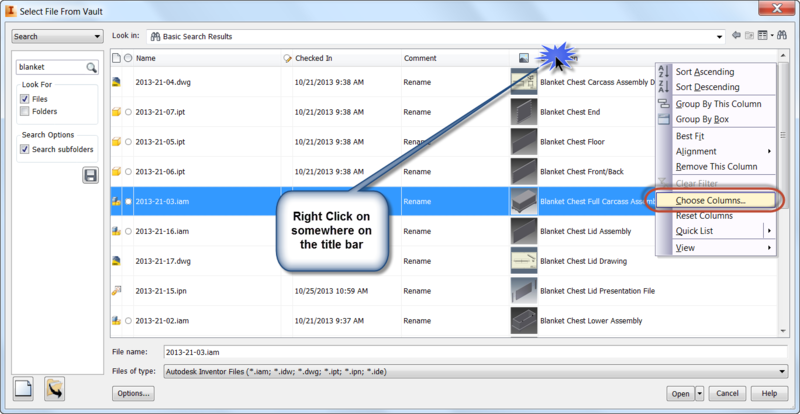 In a previous post, I talked about how I had created a non-nonsensical file naming scheme to place my files in Autodesk Vault. 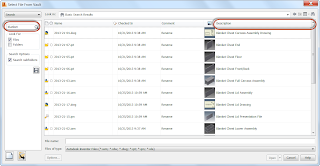 I also talked about how I needed to use the indexing of properties inside of Autodesk Vault to make sure that I tracked all the files correctly. In this example, I'm using the a blanket chest I found in the book "Pleasant Hill Shaker Furniture" book. Which you can find at the link HERE. That's all fantastic. But how do I accomplish that? 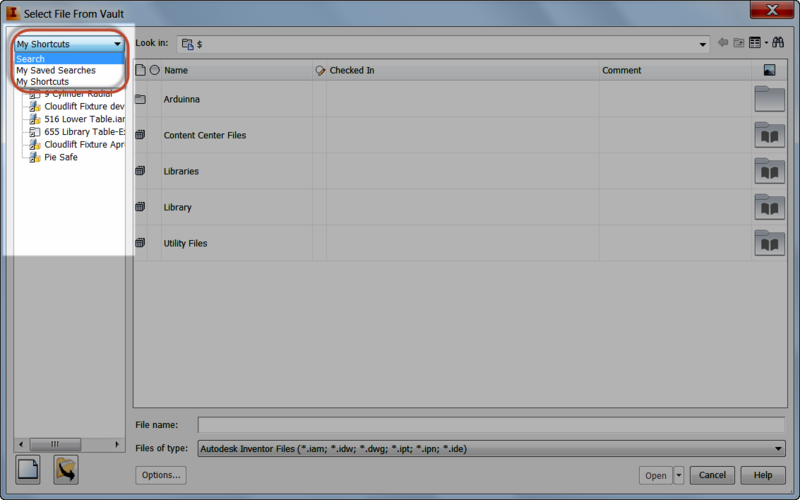 First, I have to make sure that I fill out properties in Inventor's iProperty screen. Sure, you could argue it takes extra time, but it only takes a few minutes, and the payoff, being able to find files, is well worth that work. 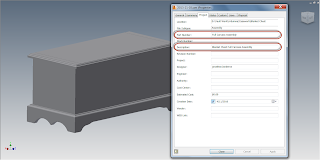 Do all the iProperties in Inventor have to be filled out? No! But what should be filled out, are the ones that are important to you! I fill out fields like Title, Description,and Keywords. I could fill out more, but these are plenty for what I need. But how, when opening a file, do I find the files? First, start out by choosing the Open from Vault icon. 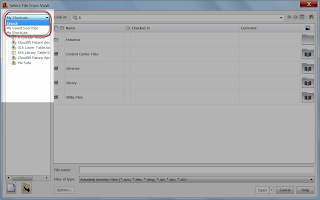 This will open up a dialog box that looks a lot like the Inventor File Open dialog box. Make sure to choose Search from the pulldown in the left hand column. This will switch the search screen, that where searches can be made for Files and Folders by names, and.... .(wait for it)... 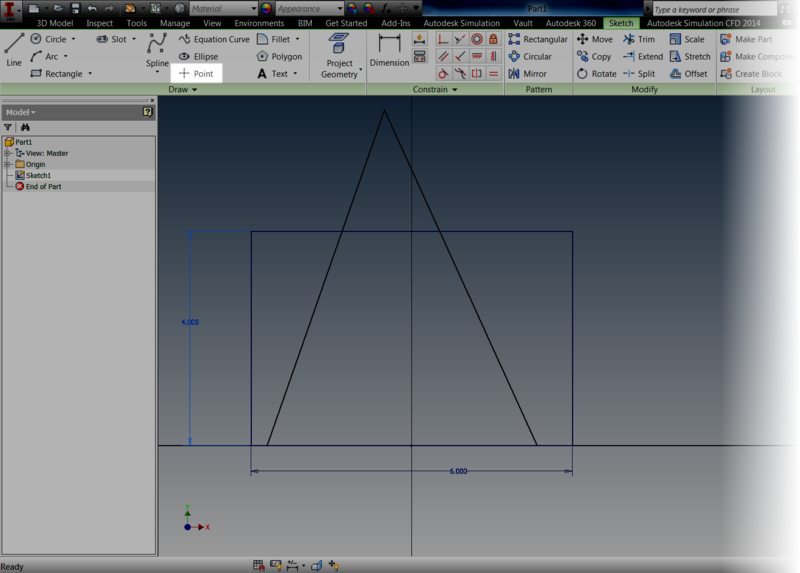 The properties I entered in the iProperties into Inventor. Also note, that when the search screen is selected, a flyout opens that shows all the different properties used inside of Vault. 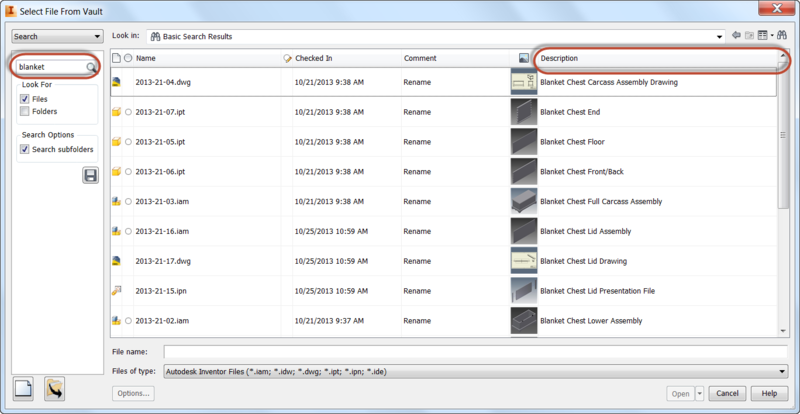 All properties can be searched simultaneously, or individual properties can be searched by selecting that property. In this case, I'm typing the word Blanket in the search field, and searching for all fields that contain that word. All values containing the word "Blanket" will display. In this case, the word I'm searching for is located in the Description field. 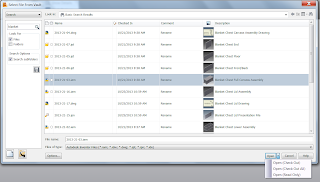 Now all that has to be done is to select the desired file, open it, and start designing! P.S. All the columns may not display in the first view. 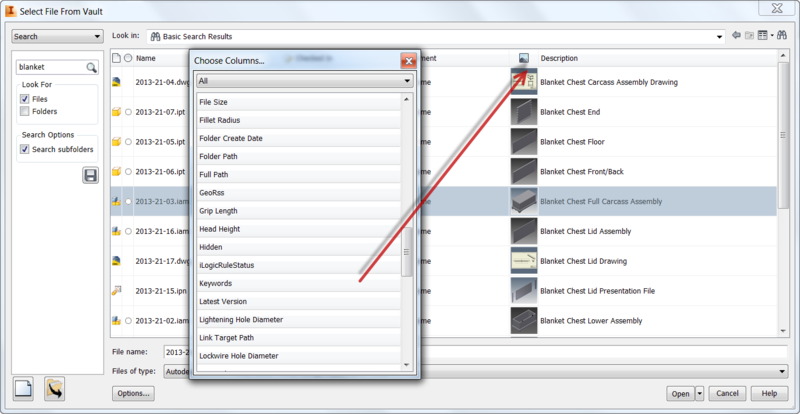 To show the desired columns, right click on the Title Bar and choose "Choose Columns" from the menu. Now a list of fields appears. Just drag and drop to place what you want! The Organizer in Autodesk Showcase. I think it's one of the most useful, and underused tools in the product. 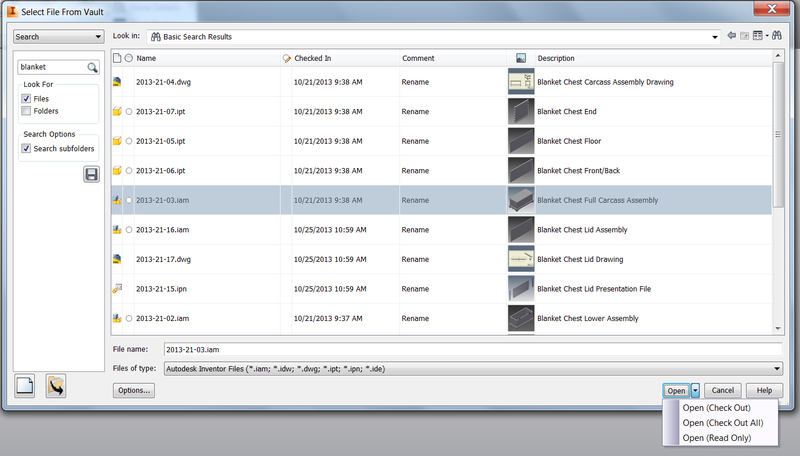 The Organize in Showcase reminds me a little of the feature browser in Autodesk Inventor. It provides a tree that shows the structure of the components in a scene, and allows for functions like moving and grouping together of the different objects so they're easier to work with. 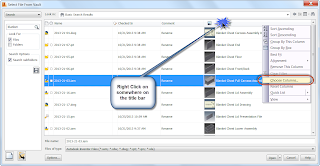 Accessing the Organizer in Showcase is easy. It's under the Edit pulldown menu, or just hit the 'O' key! And for a great video on how to use the organizer, check out the video from Marion Landry's YouTube Channel below! As always, there is some great information to be found! 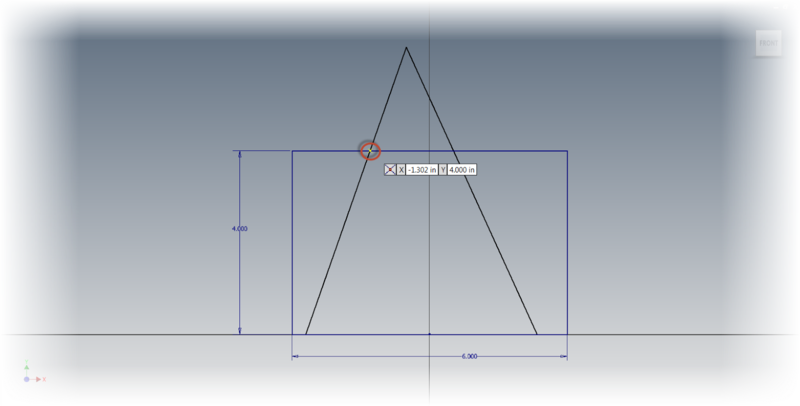 Placing Points on an Intersection in Autodesk Inventor - Did you know? The last few weeks of work and school have kept me hopping pretty quickly. So my last few blog posts have been of the shorter variety. I'm hoping to get some longer ones in the future, but for now, I have to keep them short. I hope the tips are still helpful! From time to time, I've found it's been helpful to place a dimension from an intersection of two lines, arcs, etc. in an Autodesk Inventor sketch. The challenge found here? 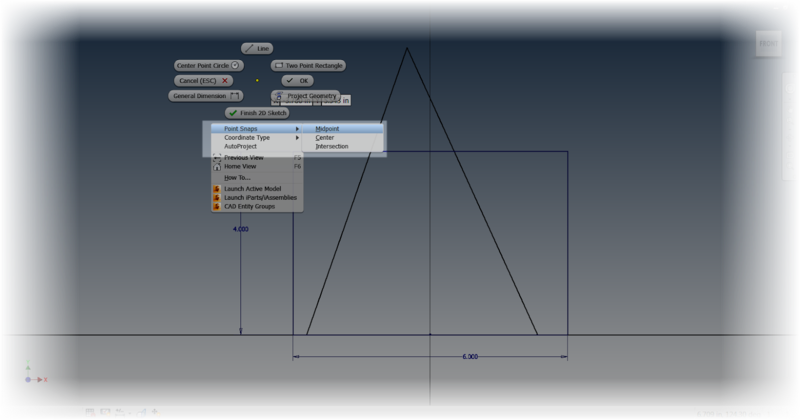 It's not something that can be done directly in the dimension tool! But with a little help from the point tool in the Inventor sketch, this can be accomplished? So what steps can be used to make this work? I'll show you with the help of the sketch below. It's pretty easy! 2) Move the mouse to the intersection. 3) Click! The point will snap automatically! Place as many points as are needed. 4) Dimension and constrain away! That's all that there is to it! If preferred, right clicking while the point tool is started will also bring up an option for Point Snaps. This option allows for choosing a snap to use, including Intersection, Midpoint, and Center. It's the same thing as the step above, with a few more options of course. But take a look at them! They're a slick little tool that can be a lot of help! I'm afraid due to a busy weekend running around, and well, having a bit of a personal life.... ;) I have to postpone this weeks blog. I'm hoping to get something for next week. This week is proving to be pretty packed too! But there will be one coming, I promise! 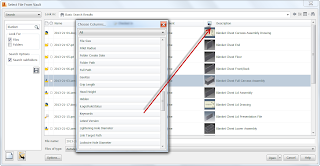 Cannot Save File in Autodesk Showcase 2014. Try this Hotfix! 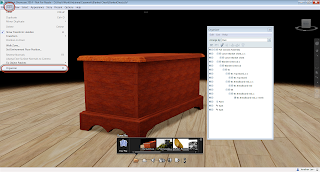 Last week, I ran into a peculiar issue with Autodesk Showcase 2014. A user was running into an error that wasn't allowing them to save a particular file. The error just stated that the scene could not be saved. Oh dear, this can't be good! My first reaction is, "Uh oh. This file is probably hosed." But before I began the funeral procession for a poor, corrupted file, I decided it was worth a little research to see if maybe, just maybe, there might be some why to save our lost file. It's a good thing I took the time to do a little research. When I did, my search located a hotfix for Showcase 2014 that fixed this very issue! It can be found at the link here! Am I glad I took that little bit of time to research! The service pack was installed, and the system was happily saving documents again! So what's the moral of the story? Don't assume too much. It took me less than 10 minutes of Google searching to find the solution. Even a few minutes search can be helpful! The file you save, may be your own! And if you're running into this particular issue in Autodesk Showcase 2014, make sure you install this hotfix!